Celebrating 20 years of Agroforestry research in Europe. EURAF and INRA, the French National Institute of Agronomical Research are very pleased to welcome you in Montpellier for the Third European Agroforestry Conference. 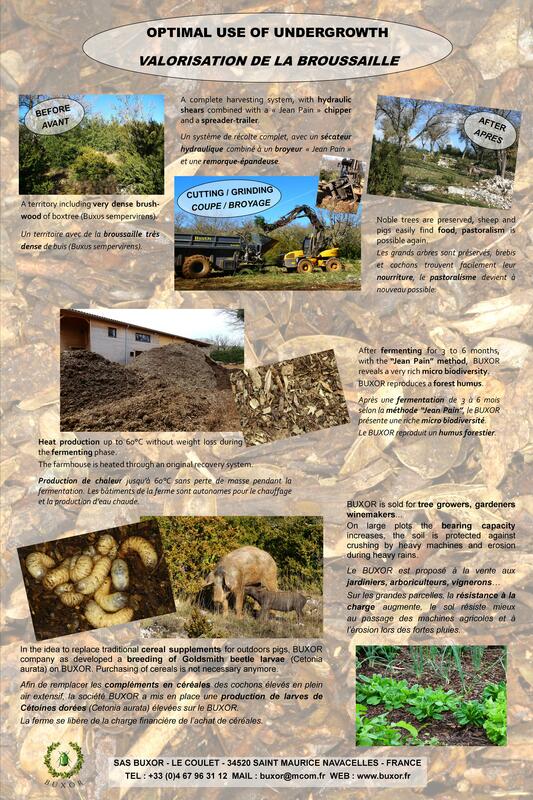 Montpellier is the core center in France for Agroforestry Research and demonstration. Both temperate zone and tropical zone agroforestry are targeted by Montpellier researchers. Montpellier is also the home of RAP, the most comprehensive agroforestry experiment in France, with 20 years of uninterrupted monitoring. You will have the opportunity to visit this outstanding site during the Conference (check the RAP leaflet here). Burning issues such as resilience to climate change or the assessment of ecosystems services of Agroforestry will be in the main light. Check the program for the wide range of topics that will be discussed, from the last research findings to the practical enforcement of new agroforestry regulations at national and European scales. New fields of research will also be thoroughly discussed, such as the selection of shade tolerant crops, the use of models to perform virtual agroforestry experiments, the labelling of agroforestry products or the revival of age-old practices such as tree pollarding. And many more. Farmers are welcome, with a session that will be focused on expertise sharing between European agroforesters. May in Montpellier is a very pleasant time, and we can only suggest you to extend your stay and visit some of the treasures that the area around Montpellier can offer you. Don’t hesitate to contact us if you need assistance. The EURAF Best Poster Awards! 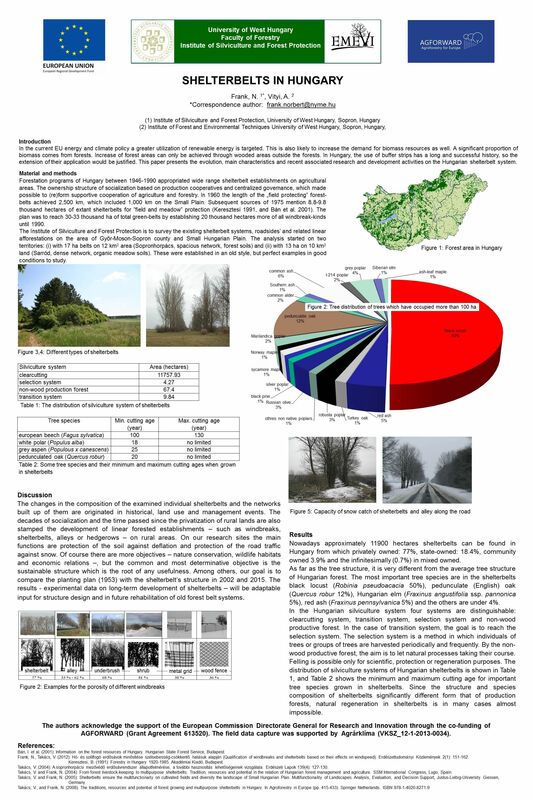 The EURAF Jury best poster prize was awarded to Cathy Bouffartigue for her poster entitled "Adapting successional agroforestry systems to an European Context with collaborative methods"
The Public best poster prize was awarded (by secret ballot) to Esther Guillot for her poster entitled "Spatial soil fertility gradient in a mature agroforestry system under a Mediterranean climate"
Congratulation to Cathy and Esther for the excellent job! Ambroise Martin-Chave - How agroforestry microclimates could affect the daily-activity of major predatory arthropods in organic vegetable crops? 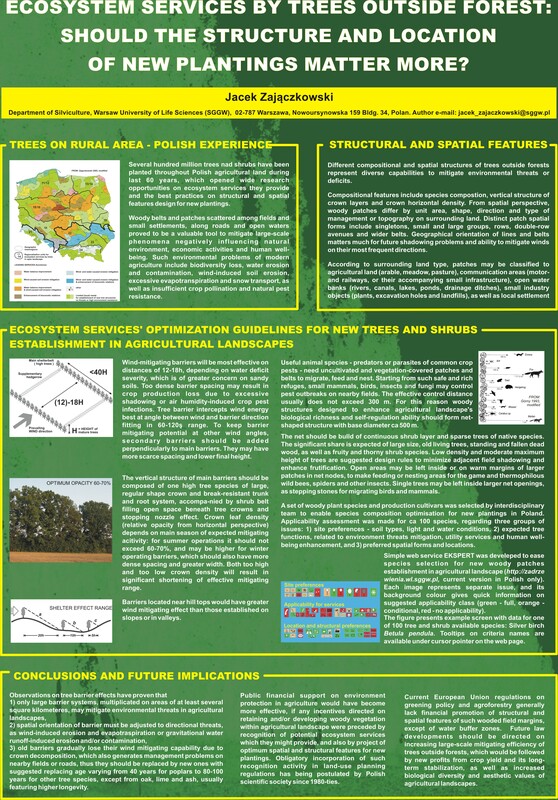 "Development of agroforestry: farmer's perceptions, barriers and incentives"
Zajączkowski J - Ecosystem Services by Trees Outside Forest: Should the Structure and Location of New Plantings Matter More? Monnier Y, Le Bissonnais Y, Maeght JL, Erktan A, Stokes A - Effects of Tree Alleys on Soil Structure and Fertility: Is There a General Pattern? 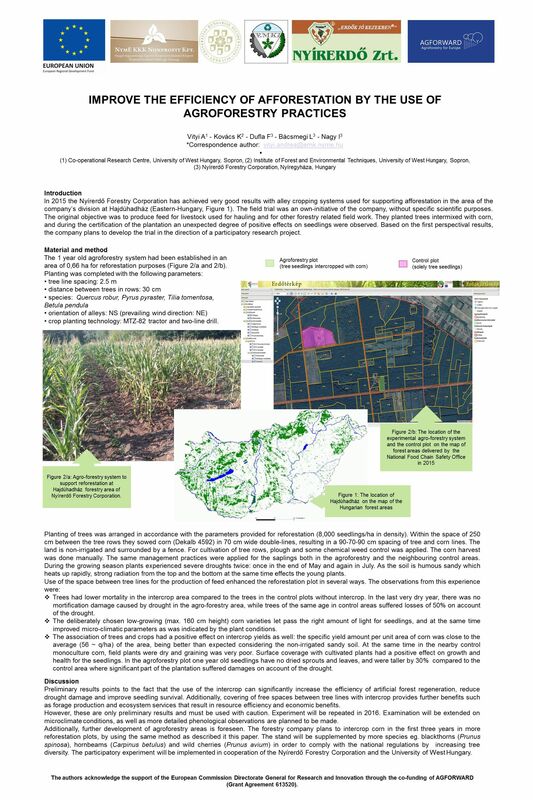 Castel L, Ronzon J, Warlop F, Poliakoff H, Fourrié L - Agroforestry Orchards Systems - How far does biodiversity contribute to system sustainability? "Productivity and economic performances of agroforestry"
"Agroforestry products: quantity, quality and diversity"
"How to assess the performance of agroforestry systems?" Anne Berger - Modern agroforestry in Switzerland: a contribution to sustainable development? Sidonie Artru - Are crop models able to efficiently simulate crop growth under shade? The call for abstract (oral communication and poster presentation) is now open. The deadline for abstract submission is the 15th of February 2016. Authors will be informed about the selection of their abstract before March 15. 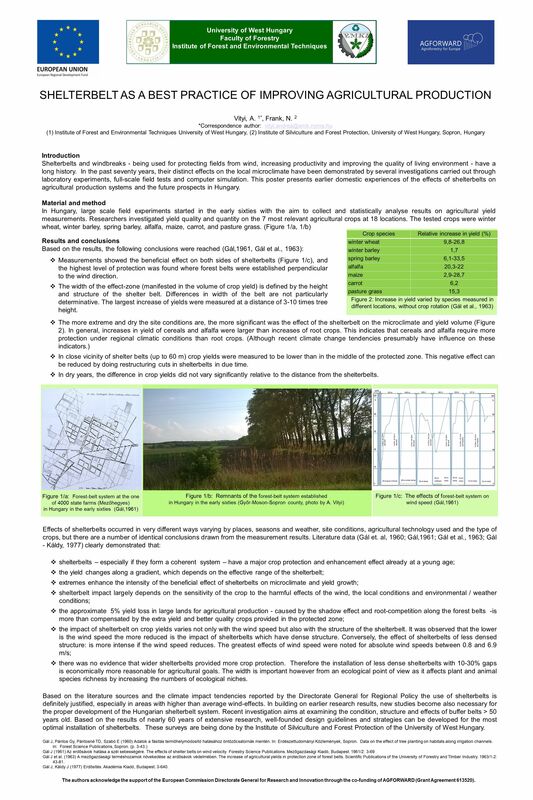 All papers related to agroforestry are welcome, with a focus on temperate agroforestry. Papers dealing with tropical agroforestry may be accepted if they are relevant to some of the scheduled sessions. Authors may suggest a session for their abstract. Papers describing agroforestry initiatives, practices and skills are welcome, even if they don't meet the usual scientific rules, but should be written in English. They will be considered for the Plenary session 2 : Farmers testimony across Europe. A special session about farmers skills and practices is scheduled on May 25 morning, and targeted abstracts are welcome. Oral communications by farmers are strongly encouraged. The language for abstracts should be english, but contact us if this is limiting your contribution. The abstract submission o over. We keep the the guidelines for submission just for reference. If you are part of the Reviewing Scientific Commitee follow this link. To register, follow this REGISTRATION link to the Alphavisa site. Your EURAF membership will be controlled by EURAF authorities. If you register for the field trip, could you please select the field tours by order of choice (1 to 3). The tours will be allocated on a first come first served basis. The conference will take place at the INRA-SUP'AGRO campus in the center of Montpellier (close to the famous "Arceaux" aquaduct). The Philippe Lamour amphitheater (380 seats) will be used for plenary sessions. 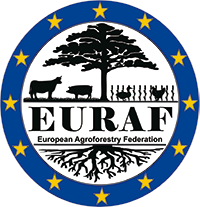 The EURAF General Assembly will be convened after the Conference, on May 25, from 17:30 until 20:30. The Assembly will elect the EURAF Officers for the next two years. The Assembly is restricted to EURAF members. EURAF membership can be obtained at registration, or on the premises before the Assembly. The EURAF General Assembly will be available by streaming on the internet, allowing all members to take part (including in the votes) from any place. 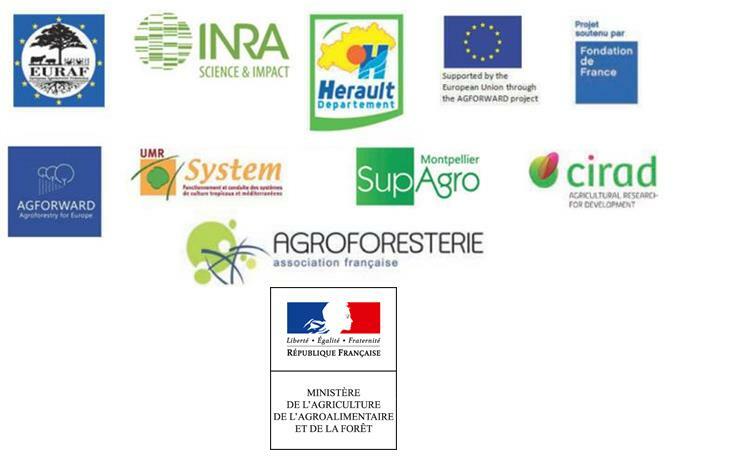 One day post-tour : "Visit Agroforestry pilot farms in SW France"
On May 26th the French Agroforestry Association AFAF will organise an optional field tour in the southwestern part of the country. Here are some more information about the provisional programme of the day and the logistics. What: You will get the chance to visit some of France's most innovative commercial agroforestry farms and meet the farmers! This event will be taking place in the action area of the multi-partner Agr'eau Programme managed by AFAF and co-funded by the local Water Agency. Agr'eau is a farmer-centred, networking initiative aiming at developing a resource-efficient, eco-friendly, climate-smart agriculture across the Adour-Garonne water catchment (south-west of France). It takes an integrated landscape approach to water and soil management, by complementing local agroforestry know-how with no-till, cover crop farming practices. How:We will meet at 9:15 at Toulouse train station. The best option would be to travel from Montpellier the night before (the latest train leaving Montpellier for Toulouse is at 21:30). From train station to the field: a coach will be organised. Registration fee: €50 for organisational costs (lunch included). Please register HERE before May 1st (spaces are limited and available on a first-come first-served basis, don't wait too long!). More detailed information on the programme and other organisational aspects will be provided the week before the event. Looking forward to having you here!